Because not every designer can build their own website. Are you the web design and development god that has no problem establishing your very own portfolio website? Or are you just like me, who relies on online platforms to upload, publish, and showcase his works. Luckily, there is an array of these said websites where creatives are given the opportunity to share their skills and talent with online communities. In this post, I listed down 7 websites you could use to showcase your design portfolio. The list contains platforms that appeared more than the others after my research of related articles. Probably the most famous portfolio platform, Behance is the leading site where you can both showcase and discover creative work. The site’s mission is to let people “take creative control” and update or broadcast their portfolio widely and more efficiently. Your work on Behance are also distributed into a network of online galleries known as the Served sites, which collect works from specific categories such as typography, branding, digital art, and many more. You may also sync your account to ProSite, a personal portfolio site builder that live on their own URL. With adorable illustrations of an octopus and a unicorn on the homepage, this platform greets you with their light personality which gives the impression that it is easy to use. Carbonmade takes pride on its simplicity (in terms of layout), ease of use (organizing images is just drag and drop), no coding setup process, and larger image displays. – Free version has limited customization options. You’re only offered color scheme, font face, and image size options. Paid plan is $12/month. You may feel limited by the options but if you want to set up something quick to establish your web presence, Carbonmade may be the perfect site to showcase your best images. Cargo is another “personal publishing platform” that offers sophisticated, free-standing websites — with an extensive collection of fully-customized design templates, simple tools for back-end maintenance, and a unique built-in user interface. Apply for an account: To maintain the high-standard quality of works posted on the site, Cargo has an invite-only membership policy. However, they constantly award membership to creatives who share samples of their work. This platform allows creatives to professionally organize and present their work in one cohesive and easily shared profile. Coroflot exposes its members to creative and design peers from leading companies from all over the world such as: Adidas, Facebook, Amazon, Apple, Nike, Sony, and many more. Why choose Crevado? Three things: free, quick, and easy to use. Customized design templates to cater your preferences and create your very own unique portfolio. All of Crevado’s design templates are responsive and automatically adapt to any screen size. Upload your files and layout everything by simply dragging and dropping. It’s also possible to sell your work online through their PayPal integration. Sign Up: Free! — It takes less than 60 seconds to sign up for a free account and set up an online portfolio. Where art meets application! Portfolio works uploaded on this site are organized in a comprehensive category structure including: photography, digital art, traditional art, and many more — along with vast downloadable resources such as tutorials and stock photography. In this platform, creatives share screenshots (shots) of their work, process, and projects. 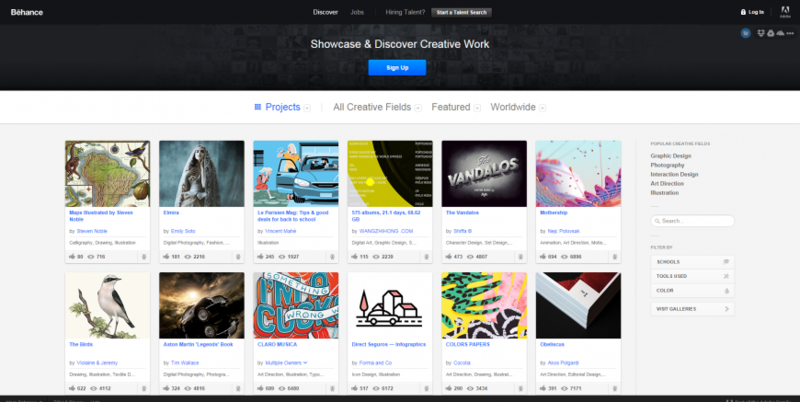 Anybody can sign up to discover, follow, and hire designers on Dribbble. But there’s a catch! Just like in Cargo, an invitation is required for you to be able to upload shots or leave comments. Invited creatives will then be called Players. One must mark his/her account as a Prospect if he/she wishes to be invited. The invitation process is done to make sure that only the most interesting works are featured. Did I miss an online platform that you think deserves to be on the list? Feel free to share them through the comments box below!